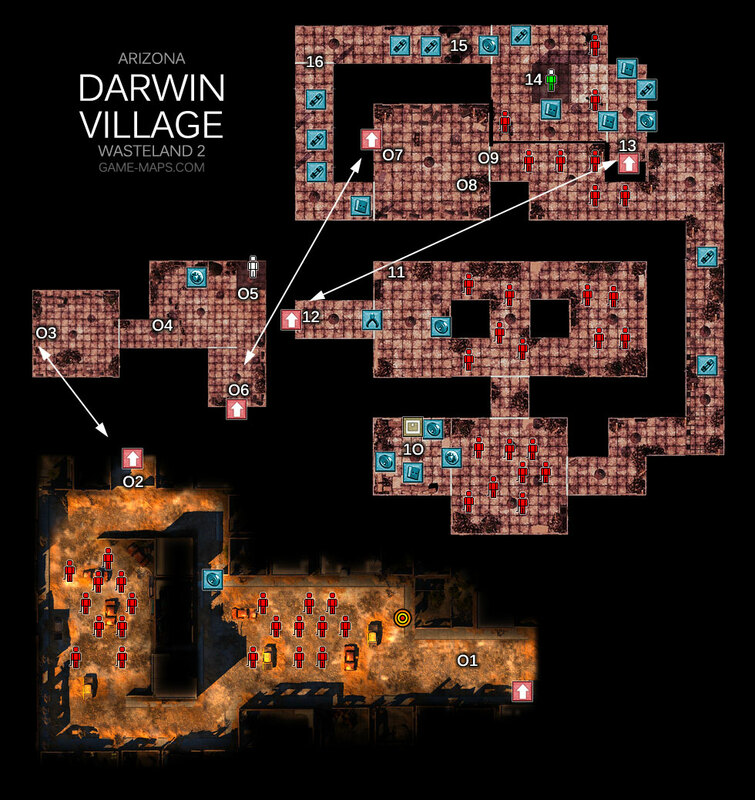 Darwin Village Walkthrough - Wasteland 2 Video Game Walkthrough with Maps & Game Guide. Quests, NPCs, Items, Secrets & Hints, Enemies, Skills to Use. Time has not been kind to this place. The buildings are fire-blackened ruins, and it's knee deep in shifting sand. It's also overrun by plague-ridden zombies, but that's new. QuestRail Nomads CampShow mysterious log book to General Vargas We found Darwin Village and made our way into the ruins. There are groups of crazed mutants wandering the area and they do not seem friendly. 02 Password id PROTEUS, you can find it in Ranger Citadel Museum. An ancient military facility, firebombed into rubble, but it looks like somebody thought there was still something of value inside. There are fresh footprints in the sand that carpets the entrance way. The footprints look like they were made by metal feet. 03 Everything in here was smashed and burned by professionals long ago, but it looks like they missed something - a hidden door in the back wall. It's open now, and recently. The metal of the door frame is the cleanest thing in the room. The monk is in several parts, chopped up by the axes and machetes of the mutants. Their strength must have been incredible to make a dent in his synthetic hide. Glass-doored, climate controlled closets line the room, all filled with shelves of neatly labeled test-tubes, and all still running. One cabinet is open, and one test-tube is smashed on the floor, next to a dead metal monk. It wasn't what was in the test-tube that killed the monk, however. It was hacked apart by the diseased mutants whose corpses surround it - and it hacked them apart too. A mutual massacre. As you enter, there is a movement from behind the glass door of the closet at the back of the room. An antique five pointed star. Under the ribbon is a golden eagle and an image of a woman holding a shield. On the back, the word "Bellona" is engraved. Honest Jon from Atchison Camp (05) will tell you story about this medal. ItemBlack List An old sheet of paper with red and black stains. The names "Ace" and "Hell Razor" have been crossed out with blood. QuestDarwin Village Cure the diseased mutants. Jan asked us to flip a switch on the purification system to turn it on and cure the mutants. 06 Doors to rest of complex. 07 Ladder leading back to the surface. A sheaf of papers are strewn across this desk. The topmost one reads, "MEMORANDUM - Once again, I must remind everyone that my name is Irwin Finster, not Erwin. Please, the work we are doing here will make history. We should at least try to get our spelling correct so the textbooks will report the truth." ItemDisplay Screen It can be used in Playa Del Rey (08) to repair GPS Device. 09 Doors, its quite hard not to kill mutants, you can try to run and do nor shot. Or just kill attackers. QuestDarwin Village Cure the diseased mutants. The purification system has been turned on. 14 Night Terror - open cage with high Computer Science. There is no known code for Night Terror for me, however its possible that Jan will give you this code when you will be abble to do his quest without killing mutants. Night Terror its is a peaceful creature. Meat its a "Candy" for Night Terror. He will join you as a pet. tip by John Jenkins Code for Night Terror is ICEBURG found on one of the tables on the 2nd level. 15 Massive Tank - shot it. QuestDarwin Village Cure the diseased mutants. We couldn't save enough mutants in the lab. In fact, we sort of murdered most of them on our way in. QuestRail Nomads CampShow mysterious log book to General Vargas With the info that Jan gave us, Team Echo must decide if we'll keep the mutants' existence a secret or tell General Vargas the truth. tip by bazz NPC Pizepi Joren will join you (high Charisma needed) after you exit the underground lab.